University of Glasgow archaeologist using cutting edge technology on remnants of the Antonine Wall has shown parts of it were painted in bright colours. Dr. Louisa Campbell's research, which has used x-ray and laser technology to analyse parts of the Roman Empire's most north-western frontier, showed it was painted with vibrant red and yellows. Dr. Campbell, a postdoctoral fellow in Archaeology at the University, looked at pigments applied to Roman sculpture, with a focus on distance stones from the Antonine Wall. She said these vibrant coloured stones were Roman propaganda against the indigenous local communities: "The public are accustomed to seeing these sculptures in bland greys, creams, white (for marble) and don't get the full impact that they would have had on the Roman and indigenous audiences 2000 years ago. "These sculptures are propaganda tools used by Rome to demonstrate their power over these and other indigenous groups, it helps the Empire control their frontiers and it has different meanings to different audiences." Dr. Campbell said that some of the colour sculptures tell stories of different Roman legions and their loyalty to the Emperor as well as their part in the construction of the Antonine Wall, one of Scotland's UNESCO World Heritage Sites. She added: "The distance stones tell us how many feet were built by each legion and are dedicating their allegiance to the Emperor Antoninus Pius. These sculptures are unique to the Antonine Wall and the best preserved example of frontier statuary from any Roman border. "They were embedded into prominent positions on the wall (probably crossing points at militarised forts) for full visual impact. The colours would have been a very powerful addition to bring these scenes to life and aid in the subjugation of the northern peoples." Her project—Paints and Pigments In the Past (PPIP) is part funded by Historic Environment Scotland (HES)'s Archaeology Programme. The aim of the project is to identify the colours of paint pigments applied to the sculptures from the Wall and then to recreate an authentic palette of colours to allow them to be physical and digitally reconstructed. 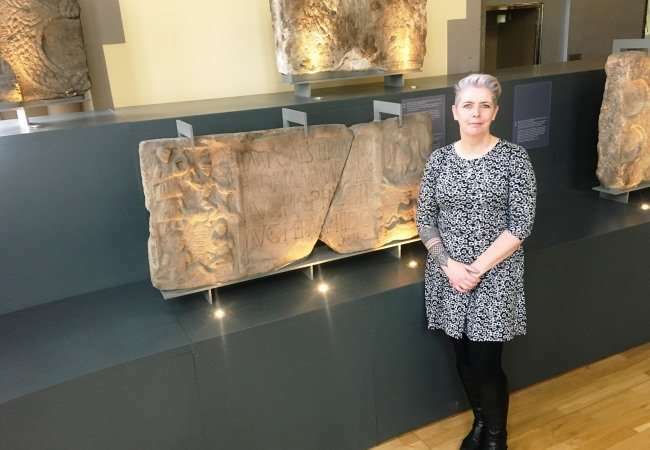 Patricia Weeks, Antonine Wall Co-ordinator at HES, said: "We are delighted to have been able to fund Dr. Campbell's work and to see these exciting results emerge. Knowing how colour was used by the Romans to tell stories and create impact is a huge leap forward in understanding these sculptures. "The information will now be used as part of our partnership 'Rediscovering the Antonine Wall' Heritage Lottery Fund bid to propose a recreated distance slab in full colour. We will also work on innovative digital methods of recreating the stones in colour that can be used for interpretation both out on the original find sites, and in the galleries at the Hunterian Museum." Most of the examples available were discovered between the 17th and 19th centuries, and are on display at the University's Hunterian Museum. Dr. Campbell said: "Many contain exquisitely carved scenes of combat, religious practice and architecture. It is likely that the sculptures were originally painted for maximum impact. However over the course of time the paint has faded and only trace elements are left. "It has been an incredibly exciting opportunity to work with the Hunterian collections and use cutting-edge scientific instruments to undertake non-destructive analysis of important cultural objects." As well as The Hunterian, Dr. Campbell has also visit other collections for sampling, including the National Museum of Scotland in Edinburgh, the Yorkshire Museum in York and the Great North Museum in Newcastle upon Tyne. The Antonine Wall is a Roman Frontier built in the mid-2nd century AD which crosses Scotland between the Fourth and the Clyde. Dr. Campbell has presented these initial conclusions at a talk this week in The Hunterian and will publish her full findings for peer review once completed. Using non non-destructive in-situ analysis using pXRF (portable X-Ray Flourescence) and Raman Spectroscopic analysis, for the first time has been able to look at archaeological remnants that have been subjected to environmental process which have impacted the survival of viable samples. However, the work has confirmed polychromy on these sculptures and a restricted palette dominated by reds and yellows is evidenced. There is a clear format to the application of pigments in the Roman Empire with specific colours expected to appear in certain contexts, eg reds in letters and Roman cloaks and military standards, different colours of red depicting spilled blood of indigenous captive warriors and ochres probably applied in layers to provide life-like skin tones, as evidenced on marble statuary. There is even evidence for red on the beak of the Roman eagle which Dr. Campbell suggests symbolises the eagle feasting on the flesh of her enemies. A base layer of gesso was applied to the stones in the first instance which was then painted onto, but conservation practices appear to have negatively impacted the survival of these exquisite sculptures. This is innovative work that has not previously been attempted. It presented some challenges which have now been mitigated and the next phase of the research seeks to determine whether other stone statuary, including Pictish symbol stones and other early medieval sculpture was adorned in colour. 'Fourth and Clyde ' ? ?